This Cape Winelands Guide to the town of Stellenbosch in the Western Cape, South Africa offers a variety of attractions, activities and Stellenbosch accommodation options. One of the most attractive and historic towns in the Cape Winelands, Stellenbosch is surrounded by vineyards and beautiful mountain scenery. Elegant Cape-Dutch architecture and 5 individual wine routes draw visitors year round. Also a thriving university town, Stellenbosch has a long history of academic and sporting excellence.This Cape Winelands town was named after Simon van der Stel, Governor of the Cape at the time, and founded in 1679. It has as a long tradition of winemaking and was the first town in South Africa to offer an official wine route in 1971. Lined with spectacular Oak trees (some are National Monuments), Stellenbosch is wonderful for historic walking tours and trails. Interesting cultural township tours are also available.Stellenbosch today offers an excellent base for a Cape Winelands holiday. Every type of Stellenbosch accommodation is offered across the spectrum to suit all budgets. Choices include an historic hotel or bed & breakfast in town, close to great sidewalk cafes and restaurants, shops and boutiques, or cottages and country houses on surrounding wine estates.For an exciting Cape wine route holiday, Stellenbosch can be combined with other wineland towns and routes throughout the Western Cape, South Africa, contact a Siyabona Africa Consultant for advice and guidance.For a fabulous Stellenbosch wine route holiday there are 5 sub-routes to explore covering the entire area and around 200 participating cellars and wine makers. A wine route tour can be organised or wine route maps and car hire arranged for self-drive options. Stellenbosch is 45 minutes by car from Cape Town.Apart from wine tasting and cellar tours, visitors can also enjoy fruit picking, cheese making tours and tastings, sample olives and olive oil, also honey, nougat and grape juices. Wine route restaurants and picnics are legendary and should be planned into every Cape Winelands holiday itinerary. Culture is very much a part of Stellenbosch which has at least 7 theatres, for example the Oude Libertas Theatre and Spier Amphitheatre. You can enjoy productions and live music offered year round. December and January are especially popular for special open air productions and picnics in the evenings. 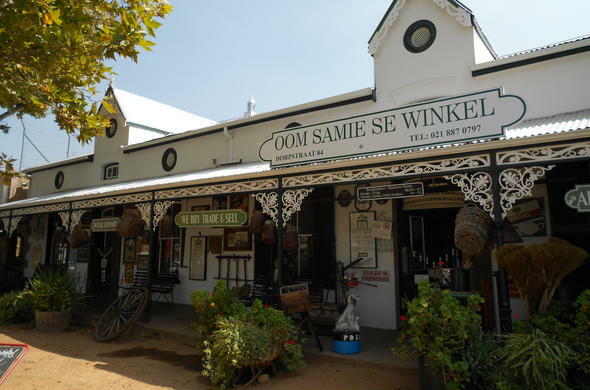 Visit The Stellenbosch Museum and the quaint Dorp street for a trip back in time.